Just Push Start recently got hands on with Venom’s multiplatform gaming headset, the Marauder 7.1 Headset. Key features of the device include 7.1 virtual surround sound, 40mm Neodymium drivers, a foldaway microphone, vibration technology, and an in-line volume control unit. This really is a multiplatform headset covering most of the current and past gen consoles, working with Xbox One, PlayStation 4, Xbox 360, PlayStation 3 and Windows PC. The headset is rather cheap at only £49.99 falling into the low-budget headset range. Can it handle the competition? Let’s find out! Visually the headset fits well and truly into the modern sleek headset category. Mostly made of black plastic there is some red to flair the design, limited to a small hint on the headband and a small section of the earcups. The microphone when folded away fits perfectly into the design of the headset, not poking out, maintaining the sleek look. It’s nothing special so aesthetically it falls into the middle ground, the “play it safe” area. This isn’t bad by any stretch of the imagination though won’t be wowing consumers. For the price you’re paying, the Venom Marauder 7.1 pulls off a solid audio performance. For the most part, no matter what type of game you’re playing it pumps out bassy, crisp sound. Only when the volume is fully cranked up does the headset lose its way. The 7.1 virtual surround sound is an extremely nice experience: allowing wearers to pinpoint where enemies are coming from in first person shooters, helping to build that audio layer of immersion in role play games and even giving gamers a sense of raw engine power in driving games. Note that it is only virtual 7.1 surround sound. While there aren’t 7 speakers and a subwoofer crammed into the headset it does surround the player with sound, doing a respectable job at mimicking the speakers virtually. For some games adjustments were needed for the audio output settings, though this could be a result from testing the differences between headsets. Once set up properly, the Marauder 7.1 performed decently audio wise. The headset is comfortable to wear for long periods of time, thanks to a combination of the earcup and headband cushioning. Even while wearing glasses it didn’t feel like the frames were being squeezed into the side of my head. The earcups being of decent size probably allowed for this more than the cushioning but both make it a comfortable headset to wear. 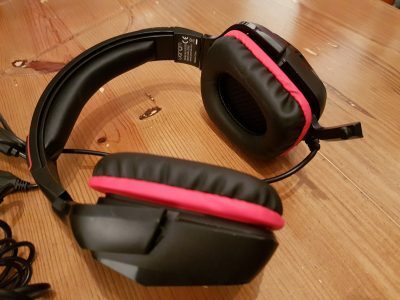 Wearing some headsets for a few hours at a time can become a little uncomfortable but the lightness of the Marauder 7.1 headset negates this issue complete. Certainly, a strong entry in comfort terms. 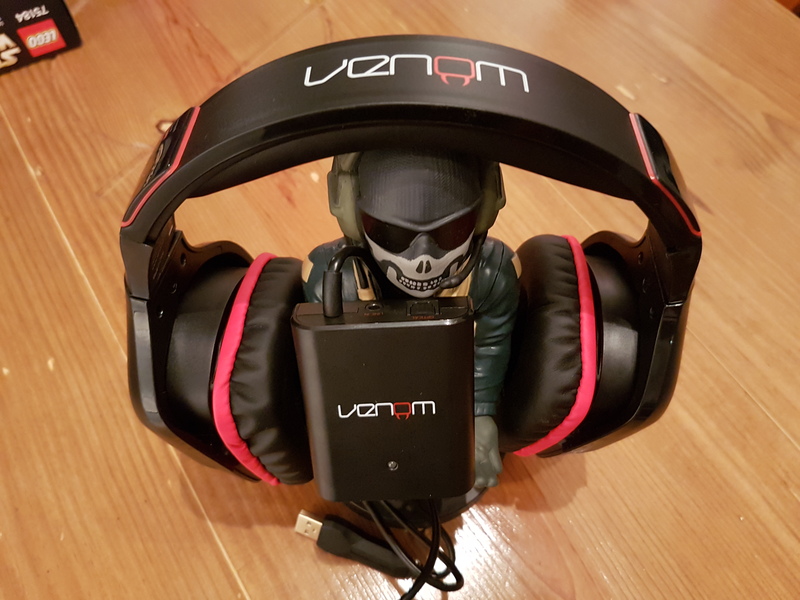 Setting up the Venom Marauder 7.1 headset looks less plug and play, when unboxing, than it actually is. There are a lot of wires in the box: most are more for choice depending on how you want to connect the device. Past an initial minute of selecting and plugging together the job is done. For the reason of putting wires together there are two on-wire boxes. The first on the headset wire is an in-line volume control unit which has the standard mute and volume adjustment options so they are close to hand, and also a vibrate adjuster. The larger box is what the headset plugs into to give a USB option for plugging into a PC, this box also has the option for toggling the 3D sound feature. This makes little difference so it is more preference of whether you like it on or off. 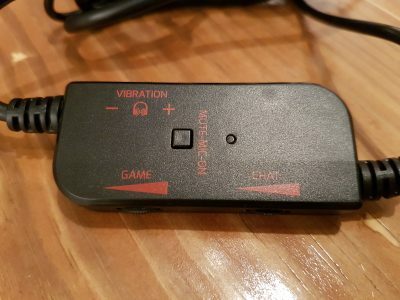 The adjustable headset vibrate option is an interesting feature I’ve not seen before on a headset. This will not be for everyone, providing a chalk and cheese style response from people. Effectively, as music or game sounds become a bit heavier bass-wise the headset starts to vibrate allowing the wearer to really feel the bass. It is an odd sensation that for some is off-putting leading to being immersion breaking when in-game. It did take a little time to get used to and while it may be a bit peculiar I have ended up keeping the rumble turned on. It isn’t quite an on/off decision, with a scroll wheel of choice, but I feel gamers will treat it as a such. The microphone is a huge let down for the headset. It was to be expected as the mic boom does not extend far from the headset but it sounds incredibly quiet. Making the issue greater, and stopping you from just trying the capture volume up, the mic captures surrounding sounds and even noise from the headset speakers. This can be irritating for others when using it for Skype or Discord, as they are left straining to hear you or listening along to your music. Cable length isn’t an issue for the majority of PC gamers. Alas, for console gamers, whom will often sit further from the console, the length could provide some limitations. The combined length of the cables is between 2-2.5 meters, allowing for it to be comfortable to sit just under 2 meters from the TV. 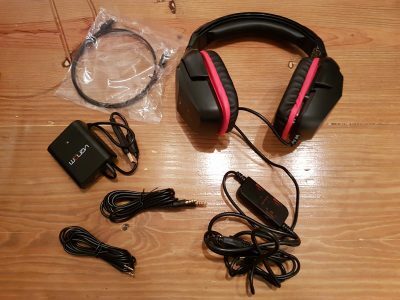 This is a surprising limitation for a multi-platform headset and leads me to the conclusion while it works with all perhaps this is a low budget headset aimed towards PC gamers more so than console players. The Venom Marauder 7.1 is a solid entry into the low-end headset market from Venom. While it isn’t going to be challenging the more expensive top performing headsets for depth of sounds, it can be considered competition for headsets of a similar price range. The functionality for adjusting volume and vibration is spot on, even if just the thought of a vibrating headset is weird. It is comfortable to wear for hours at a time, perfect for long gaming sessions if playing solo. I say solo as communication wise the mic is lacklustre at best. Unfortunately, for a modern gaming headset this is a necessity, therefore is feature that drags the headset down as an all-round package. Overall, for audio the headset is worth it, otherwise it doesn’t quite deliver.